Tehilla went up 10 grams! She has also been eating a lot more. Last night, she ate 70cc. One of our pediatricians came in to see her and was very happy. He said if she kept gaining then we would be discharged. Dr. Erez gets the final word on everything, so we need to wait to hear what he says. Tehilla smiles. Milestone-shmilestones...she definitely smiles. Here is a picture of her smile that I just missed. 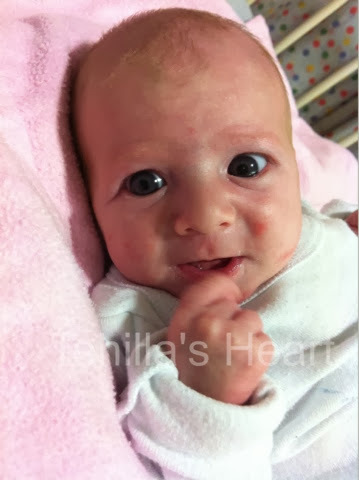 Wouldn't you smile if you were (G-d willing) going home for the first time? Phenomenal photo of a phenomenal girl. Sending fat thoughts :) and big hugs!